In many ways, Stephan Daldry's production of J.B. Priestley's An Inspector Calls is a story for us to see through multiple frames. Daldry first staged this production in 1992 at the National Theatre and then subsequently restaged it for the West End, Broadway, and multiple tours in the intervening years. 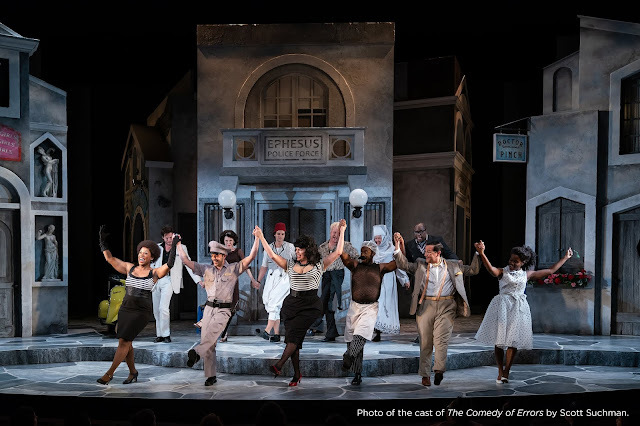 Priestley wrote the play in 1945 and chose for its setting 1912; thus, we already have frames around the production at Sidney Harman Hall at the Shakespeare theatre of 2018, 1992, 1945, and 1912. Of course, the most apparent frames to the audience are the ones Daldry depicts through staging choices and stunning design work by Ian MacNeil (Scenic and Costume Designer), Rich Fisher (Lighting Designer), and Stephen Warbeck and Sebastian Frost (Music and Sound Designer, respectively). Instead of a simple drawing-room design, we are thrust into a heightened theatrical world of London Blitz orphans cowering in a theatre and a marvelously picturesque Edwardian dollhouse just large enough to hold the dinner party of the wealthy Birling family, celebrating the engagement of daughter Sheila (Lianne Harvey) to Gerald Croft (Andrew Macklin). 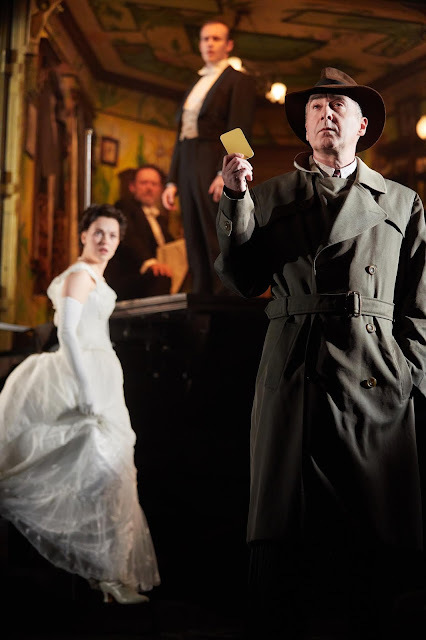 Photo of Liam Brennan as Inspector Goole and the cast of An Inspector Calls by Mark Douet. As soon as the curtain rises, we can intuit Daldry's vision for the play: to make the subtext text through staging and design. On paper, it can sound trite or feel like an oversimplification, but this production excellently proves that with enough skill, such an approach can feel like a triumph of artistry. The bleakness of the street outside the Birling home contrasts stunningly with the warm colors and lights of the interior, just as the suit of Liam Brennan's Inspector Goole stands starkly against the men's white tie and elegant gowns of the ladies. If Priestley's text ever feels prey to moments of dated stuffiness or melodrama, Warbeck's score leans into the drama with cinematic swells that remind the audience of just how much we actually enjoy such things. The performances by the ensemble are right on point with Daldry's vision, from the hauteur of Christine Kavanagh's Mrs. Birling to the Hamish Riddle's collapsing scion of the family. Priestley's text resonates as strongly in our day as it did on the heels of Margaret Thatcher's tenure as Prime Minister, and as the second World War came to its end. It's remarkable how fresh and pointed Priestley's play feels, and that the production's bite hasn't dulled through repetition and revival. An Inspector Calls is stylish, timely, and highly recommended.